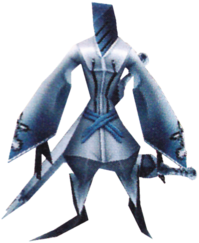 The Samurai is a high-ranking Nobody controlled by Roxas that is found in Kingdom Hearts II and Kingdom Hearts 358/2 Days. A pair of Samurai Nobodies suddenly appear as Sora and his friends approach Memory's Skyscraper, separating Sora from Donald and Goofy so that their master Roxas, who simultaneously appears from a Corridor of Darkness, can attack Sora and pull them both into the Station of Awakening. While Sora and Roxas fight within their own hearts, Donald and Goofy slay the Samurai. A Samurai has a distinctive cylindrical head that is a darker shade of grey than the most of the rest of its body. This head bears six diagonal slits on the front, three on each side. The majority of its body appears to be covered in a grey jumpsuit with bell sleeves and a lighter grey seam going down the front. Each sleeve has the Nobody emblem printed on them, and only the Samurai's black hands are visible. The creature's black, featureless, pointed feet sprout out from the legs of the jumpsuit. There is also a dark grey belt-like pattern that wraps around its waist, though it does not seem to have a purpose. The (also grey) swords used by the Samurai usually just float very close to it, either crossing behind its back or resting at either of its hips. The shape of certain parts of a Samurai's body, particularly its legs, have a vague resemblance to the design of the Nobody symbol, and it can, like all lesser Nobodies, contort itself in normally impossible ways. 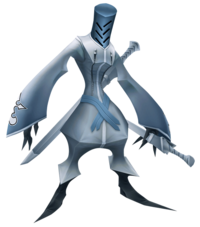 The Samurai is based on the eponymous job class from Final Fantasy. Samurai Nobodies do not attack very spontaneously. Rather, these Nobodies will remain calm and poised for a long while before sending a flurry of blade swipes at Sora. Moving slowly, but gracefully, Samurais wait for Sora's attack before attacking themselves. Their Reaction Command, "Duel Stance", results in a classic stand-off between Sora and the Nobody. The command list will go blank and the command "The End" will appear in a random command box. The command must be selected before the Samurai makes its move. If not, the Samurai will strike first and deal a fair amount of damage. If successful, Sora will slice through the Samurai, dealing severe damage. If there are other Nobodies or Heartless in close proximity to Sora's Reaction Command strike, they will also be affected by the attack. In Kingdom Hearts 358/2 Days, these Nobodies are the most powerful variety encountered. They deal high levels of damage, and since the "Duel Stance" command is not usable, they are far harder to take down. However, if they are blocked when attacking with both swords, they will stagger. The Samurais have low defense but high attack. This page was last edited on 3 April 2019, at 15:58.